NASA's Cassini spacecraft captured this image of the Saturn moon Dione on July 23, 2012. The battered face of Saturn's frigid moon Dione gets a close-up in a gorgeous photo by NASA's Cassini spacecraft. 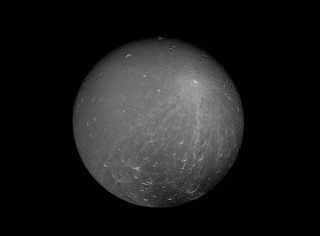 Though the image was released Monday (March 12), Cassini took it on July 23, 2012, when the probe was about 260,000 miles (418,000 kilometers) from the heavily cratered Dione, NASA officials said. Measurements of Dione's density indicate that the satellite consists of a large, rocky core surrounded by water ice, NASA officials said. However, a 2016 modeling study suggested that the moon may also harbor an ocean of liquid water, buried about 60 miles (100 km) beneath the icy shell. Fellow Saturn moons Enceladus and Titan — and the Jupiter satellites Europa, Callisto and Ganymede — are strongly suspected to have such buried oceans, which may be capable of supporting life as we know it. Though Cassini's images and discoveries live on, the spacecraft itself is gone, having plunged intentionally into Saturn's atmosphere in September 2017. Mission managers programmed this suicide dive to ensure that the low-on-fuel Cassini never contaminated Enceladus or Titan with microbes from Earth. The Cassini Saturn orbiter was the centerpiece of the $3.2 billion Cassini-Huygens mission, which launched in October 1997 and arrived in the Saturn system in the summer of 2004. Huygens was a European lander that rode piggyback with Cassini and pulled off a historic touchdown on Titan in January 2005.